Advertising Above - Page Content Below. This page last modified on 24 Jul 2009 . Return to the Genealogy Soup Bowl main page. John Pace of Middlesex County, Virginia, is my ancestor through his eldest son, John Pace who married Elizabeth Montague. I recently received a photocopy of John's will from the Middlesex County Circuit Clerk's office. 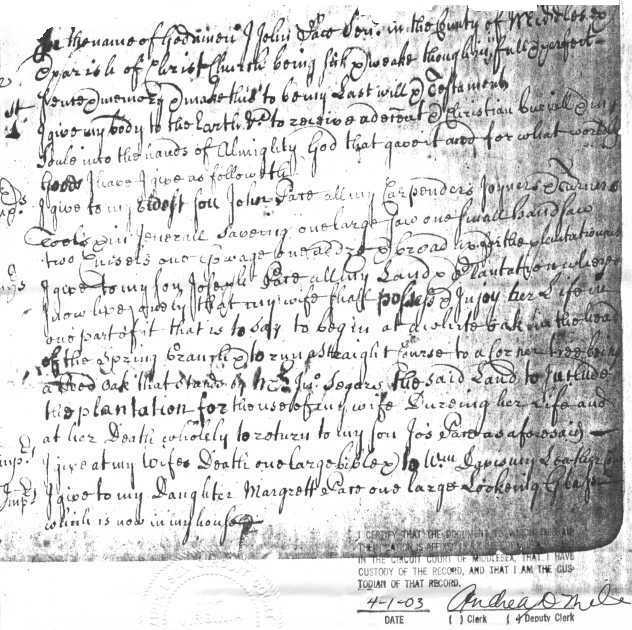 It is transcribed below, with the original document shown below the transcription. It is quite difficult to read in places, so if you find an error, please let me know. In the name of God amen I John Pace Senr. in the county of Middlesex & parish of Christ Church being sick & weake though in full & perfect sense & memory & make this to be my Last will & Testament. I give my body to the Earth & [(? )to receive a decent(?)] & Christian Burial & my Soule into the hands of Almighty God that gave it and for what worldly goods I have, I give as followeth. Imps. I give to my eldest son John Pace all my carpenders joyners & turners tools & in jenerall saving one large saw one small hand saw two chisels one gowage one addze & one broad ax for the plantation. Imps. I give to my son Joseph Pace all my Land & Plantation whereon I now live only that my wife shall possess & injoy her life in one part of it, that is to say to begin at a white Oak in the head of the Spring Branch and to run a Straight Course to a Corner Tree being a Red Oak that stands by Mr. Jno Segars the said Land to include the Plantation for the use of my Wife during her life and at the Death wholely to return to my Son Jos Pace as aforesaid. Imps. I give to my Daughter Margrett Pace one Large Looking Glass which is now in my house. Imps. I give to my Daughter Mary Pace at her day of Marriage the new narrow stript feather bed with new blanketts & a rugg with Curtanes & Vallanes thereto belonging. Imps. Further I give to my Daughter Mary Pace one table and Six new Leather Chears to be possest with at the day my wife should Marry of Otherwise at her Death. Imps. I give to my Daughter Jonane Pace a good Feather Bed & Furniture at the day of her Marriage & two Large Chares one Iron pott one Small Lookeing Glass & a Chest with Lock and Key which stands above stairs and two cows. Imp.I lend my well beloved wife all the rest of my personall Estate together with land & plantation aforementioned during her widowhood or if she Marrys to give security for the personall Estate which shall remaine after the legacys taken from it & at her Death to be Equally Divided between my three Youngest Sons Benjm, Newsome & William Pace. And further I ordaine and appoint and make my well beloved Wife my whole and Sole Executor of this my last Will and Testament revoaking against all others whatsoever in Witness whereof I have hereunto set my hand and Seale this Second Day of [(?)December(?)] in the Year of Our Lord One Thousand Seven Hundred and Twenty. At a Court held for Middlesex the 7th day of March, 1720. 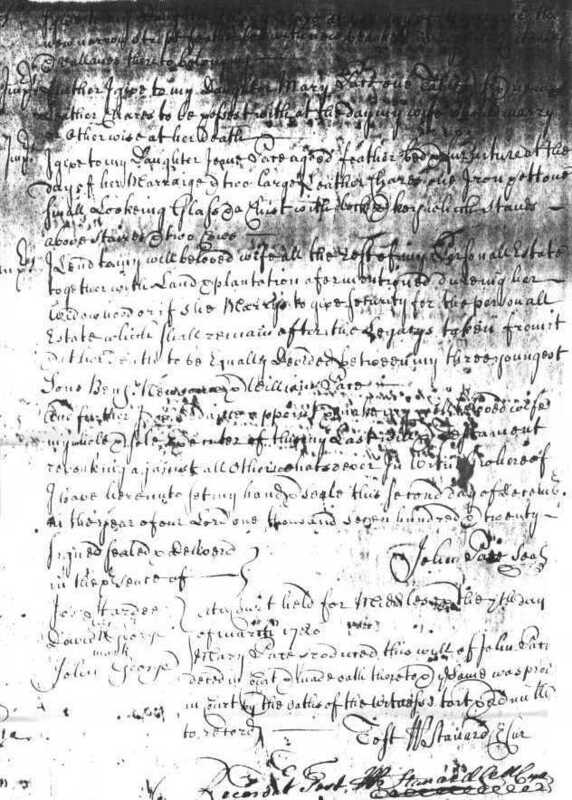 Mary Pace produced this will of John Pace deced in Court & made a oath thereunto. Same was proved in court by the oaths of the witnesses and admitted to record. Have trouble reading these images? You can see them twice as big by following these links; but be warned, the files are big and will be slow to load for most folk. Effort has been made to eliminate errors, but their absence is not guaranteed. This document is copyright 2007 by Charles Hartley. Permission is hereby granted to individuals seeking family history information to copy the contents of this document for their personal use. It may not be sold, either separately or as part of a collection, without the written permission of the copyright holder; nor may it be placed at any other location on the internet without said written permission. Page Content Ends - Advertising Below.